Drop in to our Adult RE class where we are talking about the bible. This Sunday, Terry Vodery leads an overview and discussion about the Bible’s historical, poetic and wisdom books. CHALICE CHILDREN: This Sunday, Chris leads the Chalice Children in a session about our first Shared Principle, affirming the inherent dignity and worth of every person. Parents are encouraged to dress their children in play clothes. Things may get a little messy! ROOTS AND SHOOTS: Congratulations to the Roots and Shoots Friends for completing their first project raising awareness (and funding) for infants, adults with special needs, and the elderly, in need of (environmentally safe) diapering solutions. Many families across the world must constantly make the devastating decision between food and personal sanitary needs. The Roots and Shoots friends learned about this issue and took action. We are so proud of our young UU’s! This Sunday, the class will decide on their second project for the year. YOUTH: Youth in grades 7-12 will meet in the MacArtor Library during worship. The subject for the day will be beauty. What makes something beautiful? Why? The group will look for beauty in their lives and surroundings and go through a fun poetry writing exercise. You don’t have to be a poet to participate! O.W.L. 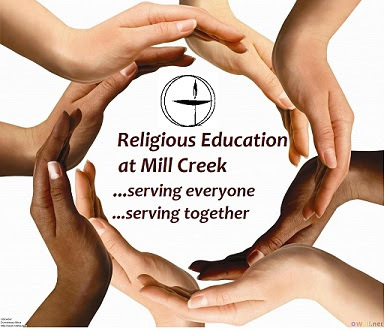 : Following worship, a guest panel of Mill Creek adults will visit the 7-9th grade O.W.L. class to discuss ways to deepen understanding of and empathy with those in our community who may face homophobia, heterosexism, biphobia, and/or transphobia.